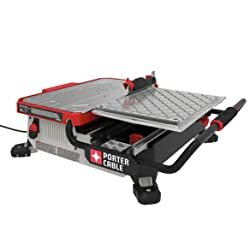 Here are some of the most important things you need to consider when choosing for the right wet tile saw. There are four types of this tool in the market and each has its respective pros and cons. Its cutting wheel is coated with diamond powder which makes it sharper and stronger. The same with the table top, you need to slide the tile through the saw blade to make the cut. The difference, this one uses a rail system which mechanically drives the tile towards the saw blade. Some units use pumps to supply water for cutting. Make sure the water source is reliable as it affects cutting precision. This is an added convenience as you won’t need to manually pour out the water from your tile saw. The tool’s motor power is measured in horsepower (hp) while rotational speed is in RPM. An ideal motor must provide a free-load RPM between 3,000 to 6,000. 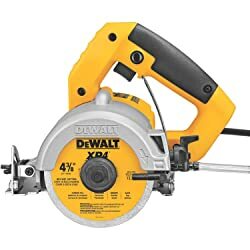 A ½ hp motor serves as the minimum requirement for a good tile saw. Some units have saw blades which can be used for wet and dry cutting. If you are only aiming for wet cutting, then have a diamond blade for your unit. This refers to the cutting depth and ability of the blade to cut through any tile material. The best thing about this tile saw it maintains a clean and precise cut from start to finish. Setting the fence had no issues and works very well. Great tool for an affordable price. Huge cost savings. The great thing about this tile saw is its Hydrolock water system where there is a constant splashing of water at the area to be cut. Other things to love about this saw include its blade guard, motor and strong plastic body which can resist wear and tear. The extension arm may be plastic but it’s really tough to do the job. Moreover, the saw is easy to clean and keep. You just need to buy a decent blade for the blade included is just a basic one. 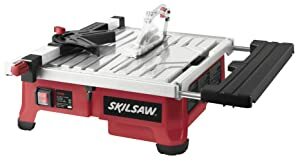 This saw tool is a great investment for it provides consistent straight cuts. The miter gauge is easy to set and hassle-free. The overall construction is sleek and tough. You can replace the blade guard hex screw with a knob in case you want blade changing to be easier. The water pump is also reliable to keep the cutting area wet and smooth for cutting. Besides that, the blade included in the package is good but not really that nice for other cutting performance. The best feature about this tile saw is its water management function. It is able to hold enough water and only have minimal splashing which makes your work clean. It can smoothly cut through ceramic, porcelain, or stone tiles around 3/8”. Long lasting and durable unit. There is a very little wobbling during operation but manageable and still provide straight cuts. This tool is simply amazing for it can cut through a cement board with ease and no difficulty in following a straight line. Its overall construction is tough and sleek. The water line fitting on both sides is made from plastic but works pretty fine. The blade works decently and no complaint about it. Else, the water is fitting is made from plastic. 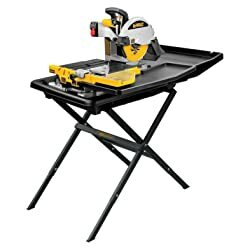 This compact tile saw is best for DIYers dealing with smaller jobs inside their home. It is light and easy to use. You can set this tool in less than 10 minutes. 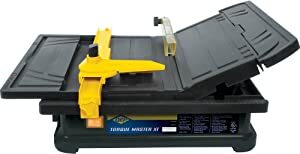 This tile saw does a smooth line cut for standard tiles, porcelain, marbles, and stone materials. Likewise, it comes with a miter gauge and rip fence. A small trouble is the ruler does not have enough measurements. 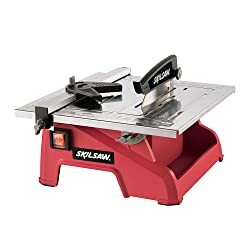 This is a great little saw which you can use for a variety of tiles. The blade included in the package is fine although it’s not that nice compared to other expensive and high-rated saw blades. Better if you'll also change the water every 20 to 30 minutes to prevent any clog-ups. There is no slide included but the guide perfectly works. 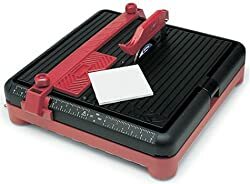 This tile saw amazingly cuts a 1-1/2" granite counter top with ease. The cutting depth can be adjusted depending on the need. The overall construction of this tool is smooth and tough. A great home and DIY tool for small and medium works. Note: just buy another expensive blade for this comes with just a decent one. 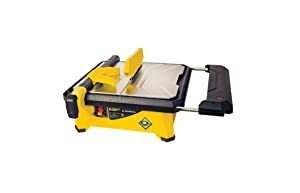 I love this tile saw for it can cut both through small and larger tiles. Make sure you’ll always be mindful of the water level inside the tile saw and replace when clay-like form starts to appear. 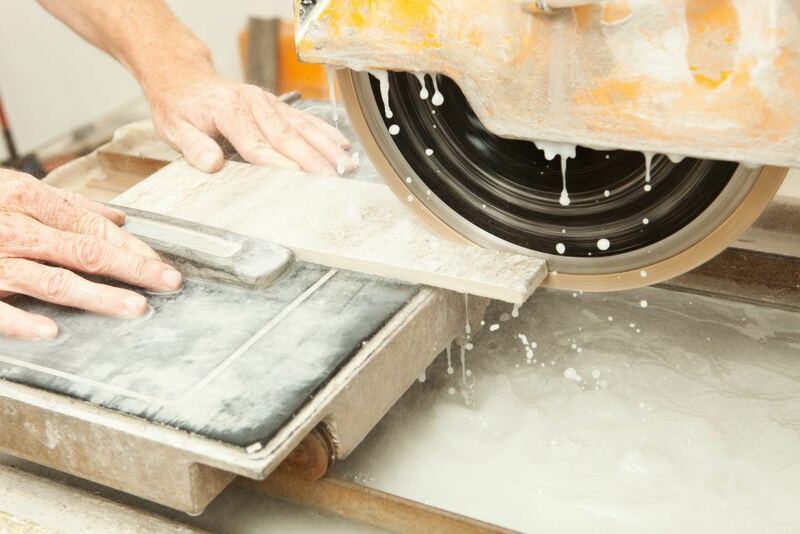 The ideal size for smooth cutting experience is around 4x4 or 6x6 tile. The overall construction of this saw tool is rigid and reliable. However, it is not that suitable for floor cutting. Right out from the box, this saw tool is so easy to set up and use. It uses no pump so no worries about clogging up. It can do smooth line straight and diagonal cuts with ease. Overall, it offers surprisingly good quality at an affordable price. There is no quick adjustment for the fence and some find the water refilling and emptying process a bit hassle.